Lugging Littlies: Front pack, baby backpack, stroller or sling? Some countries are blessed with a combination of natural beauty, historical monuments and great weather. Scotland has it all, except the weather. Yet Scots, who have mastered the art of tourism like few others, will ensure there is no dwelling on such a minor detail. Here, family fun is assured no matter what Mother Nature has planned for outside. And the search for magic in the liking of Harry Potter is just the beginning. 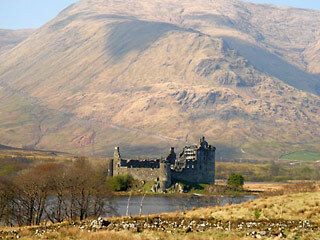 Hillwalking and historical sites, city touring and canoeing, island hoping and a great variety of museums make certain that a family holiday in Scotland is enjoyable and exciting. Whether you plan to hill walk, horseback ride or bike through mountains and mores, sail or windsurf along miles and miles of untamed coast or relax on one of Scotland's many islands, families will quickly discover what has inspired painters, poets and writers for centuries over. The rugged natural beauty of the Scottish landscape will prove hard to forget long after your holiday is over. And the Scots value each moment in history as much as every feature of their land. They will draw your attention to every stone, ruin and castle, making even the smallest feature significant. As you stroll through the country's historic sites and nearly 400 museums help older children as they wonder, what makes the Scottish national identity so strong? Once you've taken in the landscape and uncovered the country's history why not give Scotland's cities a try. Glasgow, with its modern architecture, art galleries and fashionable restaurants, and Edinburgh's dramatic setting and elegance are sure to please even the most urban jaded families. While your children may not be ready for "haggis" - a spicy sausage made of sheep or lamb innards, mixed with oatmeal, cooked in the animal's stomach and served with mashed turnip and potatoes -- hearty breakfasts and fresh seafood will ensure they are well nourished throughout the family holiday. The AA's (Automobile Association) Rosette ratings offer a reliable guide to restaurants. While children are not allowed in the bar area, a meal at a local pub offers an insight into Scottish social life. Travel Journal: Are We There Yet? I'm going to _____​_____​_____​_____​_ with my _____​_____​_____​_____​. To get there we'll travel by _____​_____​_____​_____​_____​__. We're leaving from _____​_____​_____​_____​___ and arriving in _____​_____​_____​_____​__. We will travel through _____​_____​_____​_____​_____​ on our way, cross _____​_____​ states / countries / oceans to get there, and see the following sights _____​_____​_____​_____​_____​_____​_____​____ along the way. _____​_____​_____​__ is _____​_____​_____​_ miles / kilometers from home. It will take us _____​_____​ hours / days to arrive. I packed _____​_____​_____​_____​__ and _____​_____​_____​_____​_____​_____​__ to keep me busy en route. Getting there is part of my adventure! Here's a map of the route we'll take.